This protocol describes the visualization of biofilm development following exposure to host-factors using a slide chamber model. This model allows for direct visualization of biofilm development as well as analysis of biofilm parameters using computer software programs. Beaudoin, T., Kennedy, S., Yau, Y., Waters, V. Visualizing the Effects of Sputum on Biofilm Development Using a Chambered Coverglass Model. J. Vis. Exp. (118), e54819, doi:10.3791/54819 (2016). Biofilms consist of groups of bacteria encased in a self-secreted matrix. They play an important role in industrial contamination as well as in the development and persistence of many health related infections. One of the most well described and studied biofilms in human disease occurs in chronic pulmonary infection of cystic fibrosis patients. When studying biofilms in the context of the host, many factors can impact biofilm formation and development. 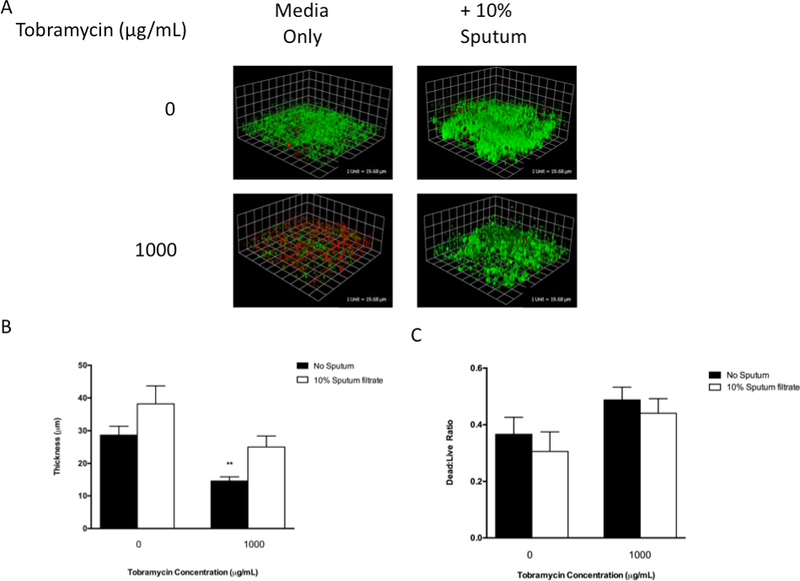 In order to identify how host factors may affect biofilm formation and development, we used a static chambered coverglass method to grow biofilms in the presence of host-derived factors in the form of sputum supernatants. Bacteria are seeded into chambers and exposed to sputum filtrates. Following 48 hr of growth, biofilms are stained with a commercial biofilm viability kit prior to confocal microscopy and analysis. Following image acquisition, biofilm properties can be assessed using different software platforms. This method allows us to visualize key properties of biofilm growth in presence of different substances including antibiotics. Biofilms are also critical in healthcare settings, as they have been shown be involved in catheter related infections, pulmonary infections in cystic fibrosis patients, as well as in numerous other infections.5,6 One of the hallmarks of biofilm infections is the decreased susceptibility of bacteria to antibiotics and impaired clearance by the innate immune system.7-9 The most well studied, clinically relevant scenarios involving biofilm-based infection occurs in patients with cystic fibrosis (CF), who are chronically infected with Pseudomonas aeruginosa biofilms. P. aeruginosa can undergo a number of changes during establishment of chronic infection that make it very difficult to treat.10,11 Biofilms can differentially activate innate immunity and drive inflammation.12-14 As these infections lead to increased morbidity and mortality in CF patients, it is crucial to understand factors that can affect biofilm development in this context. A recent study suggests that host-factors are critical in the formation of P. aeruginosa biofilm aggregates.15 These biofilms contribute to reduced susceptibility to antibiotics and host defense mechanisms. The presence of host-derived factors, such as neutrophil elastase, as well as secreted products from microorganisms present in the CF lung, have the potential to greatly modulate biofilm formation and development.16 Additionally, biofilms interact with the host to modulate expression of numerous pathways and initiate inflammation. While high throughput methods, such as the standard crystal violet assay, can provide some information with regards to the biofilm process, visualization of the biofilm in response to these factors provide more in-depth information. In this manuscript we describe a method for using factors from the sputum of patients with CF to study the development of biofilms in vitro. This method allows for rapid visualization of biofilms exposed to sputum containing host factors using a commercial biofilm viability kit. This technique can be used to visually identify changes that occur during biofilm growth in the presence of exogenous products, and represents an improved method to analyze the changes in biofilm development under various conditions. Note that Research Ethics Board (REB) is required to collect and store sputum samples from human subjects. These studies were approved by the Hospital for Sick Children REB#1000019444. Collect sputum sample from patients during routine visits to the cystic fibrosis clinic and keep on ice. Transport sputum sample on ice within the first hour of collection, to the research laboratory, to undergo processing. Record the volume of the sputum sample obtained. Add phosphate buffered saline (PBS) to 2x the volume of the sample (i.e., 2 parts PBS, 1 part sample). Mix the sample well with a transfer pipette. Vortex the sample on the highest setting for 1 min to mix completely. Aliquot 1 ml of the above mixture into the appropriate number 1.5 ml microcentrifuge tubes and spin down at 5,000 x g for 20 min at 4 °C. Following centrifugation, remove the supernatant and discard the pellet. Filter sterilize the supernatant through a 0.22 µm filter and collect in a clean microcentrifuge tube. NOTE: Sterility of filtrate is tested by plating on LB agar and inoculating liquid media. Store sputum supernatant at -80 °C for future use. NOTE: Sputum from multiple patients can also be pooled following filtration. Prior to use, dilute sputum filtrate 1/10 v/v (100 μl of sputum, 900 μl of media) in desired media. NOTE: Here, standard lysogeny broth (LB) media was used. Grow bacterial isolate of interest overnight in desired media at 37 °C with shaking (200 rpm). Note: A number of different bacteria were used, including clinical isolates Pseudomonas aeruginosa, Staphylococcus aureus, Burkholderia cepacia complex and Achromobacter xylosoxidans. Choice of media depends on strains and conditions of interest, however LB media can be used for initial experiments. From overnight culture, place 40 μl of culture into 4 ml of fresh media and grow for 3-4 hr at 37 °C with shaking (200 RPM) to obtain a culture with an optical density at 600 nm (OD600) of approximately 0.5-0.6. Dilute the culture from step 3.2 to 1/5 in desired media with 10% sputum filtrate or without sputum filtrate (as control). Other concentration of sputum filtrate can be tested (i.e., 50% or 100%). Use 200 μl of the dilution to seed wells of slide chambers. Allow bacteria to attach for 4 hr at 37 °C without shaking. After 4 hr, remove the media and gently wash the biofilm with 1x fresh media. Replace with 200 μl fresh media. NOTE: To study the effects of sputum on the biofilm, the fresh media should contain sputum supernatant. Allow biofilms to grow for desired amount of time at 37 °C without shaking, replacing media every 12 hr, without washing until the time for microscopy. NOTE: To study the effect of sputum supernatants on biofilm antibiotic susceptibility, antibiotics are added to the media following 24 hr of biofilm growth and are maintained in the media until staining and imaging of biofilms. Following desired growth time (24-48 hr works best), remove media from chamber wells and gently wash each chamber twice with 300 μl of sterile PBS. Prepare staining mixture for biofilm by mixing 1 µl of each dye (provided in the viability kit) for each ml of solution needed. Make dye in water or media solution. NOTE: Water is recommended by the manufacturer. Add 200 µl of dye mixture to each well of chambered coverglass and incubate at room temperature, in the dark for 45 min. Remove staining mixture from chambers and wash each well with 300 μl of sterile PBS. Remove PBS and replace with fresh water or media. Proceed with visualization of biofilms via confocal microscopy. Read stained biofilms in chambers immediately after staining (within 1 hr). Minimize delay in visualization of the slides by staining 1 to 2 8-well chambers at a time. Perform imaging using confocal microscope with lasers for excitation and filter sets for acquisition. NOTE: Here, the spinning disk confocal system with spectral borealis lasers (Green: 491nm, Red: 561 nm) were used for excitation. Emission filter sets of 515/40 and 624/40 were used to visualize the stains from the biofilm viability kit. Take images using a 25X water objective on confocal microscope with camera. Take 3-5 images from each well. NOTE: Thus for an 8 well chambered coverglass, 24-40 images will be generated. NOTE: Images should be saved as OME-TIFF files to be analyzed using COMSTAT18,19. Instructions for biofilm image analysis can be found at http://www.comstat.dk/. Once images are imported, parameters such as average thickness, biomass and surface coverage for each channel (red and green) can be analyzed. The overall design of the experiment is represented in Figure 1. The use of this protocol provides a convenient method to visualize the changes in biofilms grown for different periods of time (e.g., 24, 48 or 72 hr). Importantly, exogenous signals, such as sputum filtrates, can be added to visualize the changes in biofilm development. As seen in Figure 2, the presence of 10% sputum filtrates can change the architecture of the biofilm (Figure 2A, lower panels).16 These images can be analyzed using COMSTAT software to obtain key biofilm matrices, including average thickness of the biofilm, total biomass and surface coverage. This is reflected in an overall increase in biofilm thickness (Figures 2B, and 3).16 The effects of antibiotics on biofilms in the presence sputum is shown in Figure 3. By visualizing the changes in biofilm development, one can better appreciate how different factors can affect biofilm growth, to a much better extent than traditional biofilm assays, such as crystal violet staining. Figure 1: Overall design of experiment. Flow diagram of basic protocol. An overnight (O/N) culture is diluted 1/1,000 and allowed to grow to a final OD600 of 0.5. This is further diluted 1/1,000 and 200 µl is seeded into well of chambered coverglass and allowed to attach for 3-4 hr. Following this, media is removed and replaced with fresh media. Biofilms are allowed to grow for desired time. Media, exogenous products or antibiotics can be added to the biofilms. Following growth, media is removed, biofilms are stained and confocal imaging is performed. Please click here to view a larger version of this figure. Figure 2: Representative images of biofilm development following exposure to sputum filtrates. (A) Representative images of Burkholderia cepacia complex (BCC) clinical isolates following 48 hr of growth in chambered coverglass with media alone (top panels) or in the presence of 10% sputum filtrates (lower panels) followed by staining with biofilm viability kit. 1 scale unit represent 19.68 μm. (B-C) Average thickness of isolates (B) and dead:live ratio (C) of multiple images of BCC isolates grown for 48 hr in slide chambers in the absence (white bars) or presence (black bars) of sputum filtrates . Each bar represents the mean of 45 images plotted with the standard error of the mean. **p <0.001 compared to control (media alone) using Kruskal-Wallis test. Figure adapted from Kennedy et al.16 Please click here to view a larger version of this figure. Figure 3: Representative images of antibiotic treatment on biofilms exposed to sputum filtrate. (A) Images of Burkholderia vietnamiensis clinical isolates following 48 hr of growth in chambered coverglass with media alone (left) or in the presence of 10% sputum filtrates (right) with or without 1,000 μg/m of tobramycin. Biofilms were grown for 24 hr in media alone or media supplemented with 10% (v/v) sputum filtrates. After 24 hr, media was removed and replaced with media (+/- sputum) containing antibiotics. 1 scale unit represent 19.68 μm. (B-C) Average thickness of isolates (B) and dead:live ratio (C) of multiple images (n = 9) of B. vietnamiensis isolates grown for 48 hr in slide chambers in the absence or presence of sputum filtrates . Each bar represents the mean of 45 images plotted with the standard error of the mean. **p <0.001 compared to control (0 µg/ml) using Kruskal-Wallis test. Figure adapted from Kennedy et al.16 Please click here to view a larger version of this figure. The methods described herein allow for visualization of bacterial biofilms grown in the presence of exogenous products. Not surprisingly, the production of the exoproducts is of importance when using this type of system. For instance, Dithiothreitol (DTT), is often used on human sputum samples to help liquefy the samples. However, the effect of DTT alone can decrease biofilm development and viability (data not shown). Thus, proper controls for all conditions are necessary. Furthermore, the addition of human sputum products creates inherent variability on the experiment due to the fact that the sputum of each patient has a unique microbiome. To adjust for this, we have used pooled sputum samples to avoid patient specific results. Additionally, the choice of appropriate media is important when using any model system. Standard media for biofilm growth of the intended organism are recommended for initial setup of the system. If the goal of the experiment is to identify how exogenous products are affecting biofilm formation, a nutrient rich media that provides adequate biofilm formation is suggested. This will allow sufficient nutrition for growth while determining how exogenous factors may affect the biofilm. Other media, such as minimal or defined media, can be used to better mimic certain conditions. Other media have been used with good results in this system (data not shown). The attachment of the biofilms to the chambered coverglass is robust, however great care must be taken when removing/adding media or during washing steps of the biofilms to prevent disrupting the biofilms. The use of the live-dead stain as per manufacturer's protocol has yielded good results for the system described. A number of factors can affect the fluorescence ratio of the images (including dye uptake of bacteria, relative density of biofilm and detector gain settings), however, this method should relate to what is observed in the images. Other measures may be used to represent the relative amount of dead/live biofilm, such as the biomass from the dead cells as a ratio of the total biomass present in the biofilm (as derived from COMSTAT). Using bacterial counts to confirm biofilm viability in repeated experiments is recommended to confirm the visual observations of this model. Due to inherent heterogeneity of biofilms, multiple images from each chamber and multiple chambers should be used for each condition in an experiment. This adds to the cost and duration of these experiments. The acquisition of images is important prior to the analysis of data from these experiments. Care must be taken to not over saturate images and when determining the microscope setup. Depending on the level of detail required and the microscope available, a number of different objectives (10X, 25X, 40X and 63X) can be used to acquire images, though we find that 25X objective gives better images. The thickness of the Z-stack can also affect overall image quality and level of detail. Having images taken every 0.5-1 μm seems to provide clear images at 25X objective, while keeping the Z-stack images at a size that can be analyzed by COMSTAT on standard computer systems. These experiments are more costly and time consuming than other attachment assays, and cannot be done in a high throughput manner. In this procedure, bacteria attach to a borosilicate surface, which is not reflective of an in vivo condition and may affect biofilm formation and development. However, they provide additional information and can generate hypotheses for mechanism related to biofilm antibiotic resistance and physiological response to exogenous signal. If the goal of the experiment is to understand how biofilms change in response to different factors, rather than identifying anti-biofilm compounds using high-throughput methods for instance, the additional information gained using this technique makes the method worthwhile. Thus the current method is a significant advancement over previous limited attachment assays such as the crystal violet assay, which is most commonly used to study biofilms. Critical steps to this procedure include: 1) Ensuring timely processing of sputum samples to avoid degradation; 2) Being gentle with media changes on the biofilms to avoid disruption of the biofilm and 3) Doing repeated measurements of biofilm imaging to ensure an accurate representation of the biofilm thickness due to the heterogeneity of biofilm formation. Once the system is set-up for a given bacterial species, one can test a number of different conditions, including the effects of exogenous factors on multiple clinical isolates. This system has been used to study the effect of antibiotics on biofilms exposed to human sputum16 and to compare highly resistant and intermediately resistant clinical isolates.17 Modifications to the chambered coverglass, such as coating the bottom with mucin or collagen micro-scaffold (e.g., puracol), can further extend the range of experiments possible. It may be possible to adapt this system to study direct interactions, such as those between epithelial cells and bacteria, or between different bacterial species. This is an expansion of the model described by Jurcisek et al.20 The method uses slide chamber growth similar to that described here and uses formalin to fix biofilms prior to visualization. Alternatively, in this method we visualize biofilms immediately after staining and do not use a fixative. In addition, we add exogenous factors to test the effect of antibiotic on biofilms. This model thus has the potential to considerably further our understanding of bacterial biofilms in human disease. TB acknowledges a research fellowship from Cystic Fibrosis Canada. Hamamatsu C9100-13 EM-CCD QS Technologies Inc.
Spectral Borealis Qs Technologies Inc.
Beaudoin, T., Waters, V. Infections with biofilm formation: selection of antimicrobials and role of prolonged antibiotic therapy. Pediatr.Infect.Dis.J. (2016). Donlan, R. M. Biofilms: microbial life on surfaces. Emerg.Infect.Dis. 8, (9), 881-890 (2002). Hobley, L., Harkins, C., MacPhee, C. E., Stanley-Wall, N. R. Giving structure to the biofilm matrix: an overview of individual strategies and emerging common themes. FEMS Microbiol.Rev. 39, (5), 649-669 (2015). Katharios-Lanwermeyer, S., Xi, C., Jakubovics, N. S., Rickard, A. H. Mini-review: Microbial coaggregation: ubiquity and implications for biofilm development. Biofouling. 30, (10), 1235-1251 (2014). Donlan, R. M. Biofilm formation: a clinically relevant microbiological process. Clin.Infect.Dis. 33, (8), 1387-1392 (2001). Bjarnsholt, T., et al. The in vivo biofilm. Trends Microbiol. 21, (9), 466-474 (2013). Mah, T. F., Pitts, B., Pellock, B., Walker, G. C., Stewart, P. S., O'Toole, G. A. A genetic basis for Pseudomonas aeruginosa biofilm antibiotic resistance. Nature. 426, (6964), 306-310 (2003). Mah, T. F. Biofilm-specific antibiotic resistance. Future Microbiol. 7, (9), 1061-1072 (2012). Beaudoin, T., Zhang, L., Hinz, A. J., Parr, C. J., Mah, T. F. The biofilm-specific antibiotic resistance gene ndvB is important for expression of ethanol oxidation genes in Pseudomonas aeruginosa biofilms. J. Bacteriol. 194, (12), 3128-3136 (2012). Beaudoin, T., Aaron, S. D., Giesbrecht-Lewis, T., Vandemheen, K., Mah, T. F. Characterization of clonal strains of Pseudomonas aeruginosa isolated from cystic fibrosis patients in Ontario, Canada. Can. J. Microbiol. 56, (7), 548-557 (2010). Vidya, P., et al. Chronic infection phenotypes of Pseudomonas aeruginosa are associated with failure of eradication in children with cystic fibrosis. Eur.J.Clin.Microbiol.Infect.Dis. (2015). Beaudoin, T., Lafayette, S., Nguyen, D., Rousseau, S. Mucoid Pseudomonas aeruginosa caused by mucA mutations result in activation of TLR2 in addition to TLR5 in airway epithelial cells. Biochem.Biophys.Res.Commun. 428, (1), 150-154 (2012). Beaudoin, T., et al. 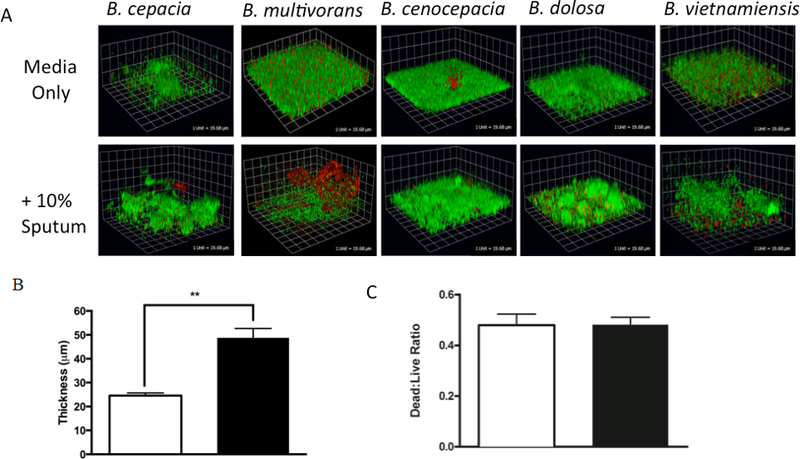 The level of p38alpha mitogen-activated protein kinase activation in airway epithelial cells determines the onset of innate immune responses to planktonic and biofilm Pseudomonas aeruginosa. J.Infect.Dis. 207, (10), 1544-1555 (2013). LaFayette, S. L., et al. Cystic fibrosis-adapted quorum sensing mutants cause hyperinflammatory responses. Sci.Adv. 1, (6), e1500199 (2015). Staudinger, B. J., et al. Conditions associated with the cystic fibrosis defect promote chronic Pseudomonas aeruginosa infection. Am.J.Respir.Crit.Care Med. 189, (7), 812-824 (2014). Kennedy, S., et al. Activity of Tobramycin against Cystic Fibrosis Isolates of Burkholderia cepacia Complex Grown as Biofilms. Antimicrob.Agents Chemother. 60, (1), 348-355 (2015). Tom, S. K., Yau, Y. C., Beaudoin, T., LiPuma, J. J., Waters, V. Effect of High-Dose Antimicrobials on Biofilm Growth of Achromobacter Species Isolated from Cystic Fibrosis Patients. Antimicrob.Agents Chemother. 60, (1), 650-652 (2015). Heydorn, A., et al. Quantification of biofilm structures by the novel computer program COMSTAT. Microbiology. 146, (Pt 10), 2395-2407 (2000). Vorregaard, M. Comstat2 - a modern 3D image analysis environment for biofilms . Informatics and Mathematical Modelling. Technical University of Denmark. Kongens Lyngby, Denmark. (2008). Jurcisek, J. A., Dickson, A. C., Bruggeman, M. E., Bakaletz, L. O. In vitro Biofilm Formation in an 8-well Chamber Slide. J. Vis. Exp. (47), e2481 (2011).